Extreme drought conditions sparked the worst fire season in Texas history this year. Since the beginning of wildfire season in fall 2010, Texas has seen 16,368 fires and close to 3.5 million acres (14,163.99 square kilometers) have burned. For many, Independence Day fireworks were out of the question because of fire bans. And yet it might have been worse. Back in November 2010, NOAA issued a long-range forecast warning of the likelihood of extreme drought conditions that would lead to a high fire risk. The advance notice of the wildfire threat allowed state fire managers in Texas and the surrounding states enough time to assess their fire risk, assets, and resources. The photo above shows the view from an aircraft carrying fire retardant as it follows a U.S. Department of Agriculture plane serving as a guide. 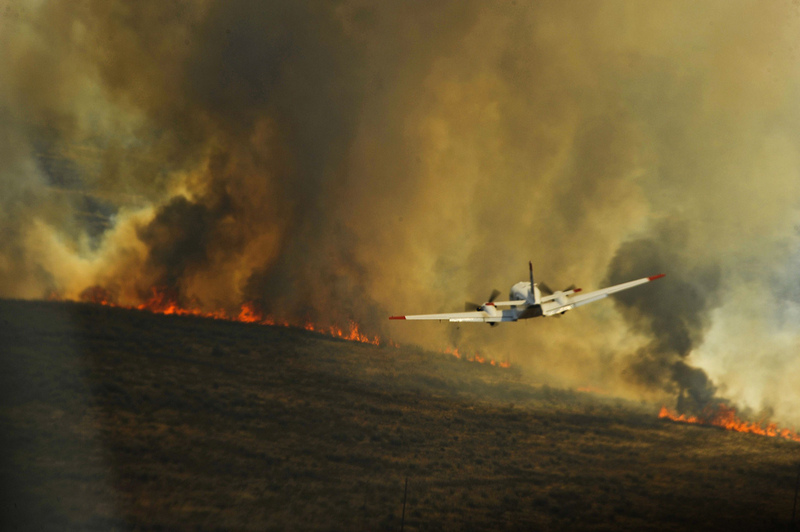 Deployed in Scurry County, Texas, in April 2011, the planes work in tandem to ensure that fire retardant is dropped precisely where it is needed. For more on dry conditions in summer 2011, see Drought in the Southern United States.